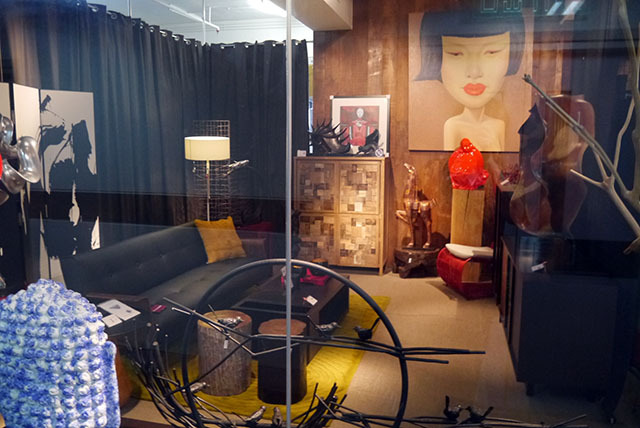 introducing Furniture Districts in the Capital of Seoul and the Port City of Busan or Pusan . virtually all cheaper furnitures resembling wood including bed posts, shelves and desks sold in South Korea are made of MDF or PB which are wooden particles – the former consisting more smaller scrapes – hard-glued and topped with again wood-patterned plastic or vinyl flat sheets . these seem hard as they do resemble wood and cleaner but will crumble in excessive moisture thus not suited for tables nor shelves . fabrics for pillows, sheets, sofas and curtains can be bought at East Gate Market . it is in the same massive whole-sale building which doubles as THE textile market in SEOUL . if you need a prized old sofa refurbished : yonder over to antique market that leads across from Hamilton Hotel at iTaewon Subway Station . this is a gathering of antique store that have long-dealt in European imports, so a few repair shops in between . single youngsters arriving to teach English as temporary residents would initially find used furnitures leaving behind by earlier arrivals now ready to leave . but thanks to mobile living for out-of-home college and mobile graduates, the whole of South Korea became dotted with single studio apartments called “one room” in the first decade in the Millennium . virtually of these come fully furnished . the only missing or private utensils including pans and brooms may be bought at the nearest hardware store or open markets which still exist in a Korea saturated by 7-11-ish convenience stores on every other corner . also if you are invited as college professors or branch officers, your company would have fully furnished family apartments . other-wise, family apartments with more than two bedrooms would be unfurnished . we are starting with SuperMarts because it is the best place I recommend foreign residents buy beds, dining tables, desks and shelves from because of smooth delivery and double-protection on warranty from the marts themselves and the manufacturer, although they tend to be more for smaller families . CostCo Korea has quite an amount of furnitures too but most are large and bulky, from indonesia . – the design also but sturdiness can only be confirmed right in front of you . while all apartment complexes have a central merchant building usually 2 to 5 stories high containing groceries and eateries in the basement and extra-studies institutes and dentists on upper floors and here is where you find a furniture store also . but these neighborhood and in-apartment complex stores carry mostly the same simple furnitures and in orange-brown wood color . aside from your neighborhood furniture stores and super-marts (wait : no one buys furnitures from department stores unless they are lazy to go anywhere, for the choice and price don’t justify themselves any more since say the seventies and eighties which the booming years when department stores rose among the ashes of war, as in neighboring Japan) people spend the time to drive-out people buy furnitures at so-called “furniture district”. this used to be a sectore in larger cities like SEOUL and Busan or Pusan, but since people had their own automobiles since 1980, larger furniture districts rose on the out-skirts . also note, a city being able to build a convention center with aide from the government, and not knowing how to hold working exhibitions within, have commonly rented out vast space to wedding halls, furniture and apparel store branches . as the latter two types of furniture outlets take barren space and/or rent for a period of time, they seldom remain constant in the same location for long . the original furniture area in old SEOUL was and the old remnent still is in East AhyunDong, between Subway Line 5 ChoongJungRo Station and Subway Line 2 AHyun Station . while interior parts such as tiles and faucets have whole-sale around again Subway Lines 2 and 5 EulJiro 4-Ga Station intersection . THE modern furniture area in the Capital began forming in NonHyunDong, smack in the middle of Korea’s richer KangNam area at the start of its real estate boom . its central pin-point is SEOUL Subway 7 HakDong Station, and spreads in all four directions for a good large block either ways . the most expensive European imports are at front, and smaller stores in rear alley, as well as those specializing in individual parts such as lighting and tiles . SEOUL does NOT have as many outer-city furniture districts like Busan, mainly because 1.the city limits have spread-out itself as far as it could, and more to include surrounding satellite cities, and 2.so many multi-purpose buildings were built initially as shopping malls, then with business NOT as expected have fallen to rent-out space to furniture stores . meaning : large shopping malls NOT as popular as strategically situated conglomerate department stores all carry substantial floors of furniture outlets – including from East-to-West : TechnoMart, iPark Mall, ShinDoRim TechnoMart and those in GaSan Digital City .. and NOT the popular JamSil Lotte World, COEX Mall, Central City and Times Square . the prime furniture district is JwaCheonDong smack in the middle of old downtown Busan or Pusan as they were pronounced after the war . the single road where Korean furniture brand names line-up, begins two blocks North of Busan Subway JwaCheon Station Exit 7, with the bulk of smaller, cheaper stores in rear-alley North-East just behind the main road . Yes they all whole-sale in theory, but will sell to individual consumers . next small groups of average furniture stores are loosely cluttered between two Subway Stations : Daeyeon and KyungSung/BuGyung University . also a more high-priced line of branches including indonesian imports, a road in-land from KwangAnRi Beach South-Western Entrance – where the old-riche of Busan lived, until HaeUnDae New Town AND high-rises along SooYoung were built over the Millennium . then there is a furniture district formed over the former leper colony in GuPyeong, atop a hill over-looking Busan’s Southern Port . this is half-way onto the Airport West, and accessible by taxi from GeoJeong Subway Station – worth the trip for I found my copy of lush italian leather sofa 😉 also another out-of-town furniture district await further North East, again North-East of GimHae – Busan’s satellite city . may be NOT worth it though, for if you’ve seen one rural outlet, you’ve seen’em all ..
call it cultural difference but Koreans don’t wash their own car but hire washers in the neighborhood who come every or other morning, more-so in larger apartment complexes . like-wise, they don’t rent uHaul trucks to move themselves but hire moving companies . iTaewon Antique Alley has long been THE place to redo sofa covers and repair furnitures . SEOUL Subway Line 6 iTaewon Station : take the narrow road across Hamilton Hotel – South and at the next traffic light is three-way crossing which is the rear-entrance to ChungHwa Apartments . there is a Seven-Eleven Convenience Store and right next to it is a steep stairs going down . they mostly do sofa covers but repairs too, and they’re too busy to even bother to over-charge you . Looking for a castle bed for girl. What is your best price ? Shipping by sea to Australia , Brisbane port. No a slide , no paint ( if will cheaper:-).